We will be serving this at birthdays, Cinco de Mayo celebrations, and every other place we can think of for the rest of our lives. Period. Preheat oven to 350 degrees; spray 9x13 cake pan. Combine flour, baking powder, and salt in large bowl. Separate eggs. Beat egg yolks with 3/4 cup sugar on high speed, until yolks are thick and pale yellow. Stir in milk and vanilla. Pour yolk mixture over flour mixture and stir very gently until combined. Beat egg whites on high speed until soft peaks form. Continue to mix while pouring in remaning 1/4 cup of sugar and beat until egg whites are stiff but not dry. Fold egg white mixture into batter very gently until just combined. Bake for 30-45 minutes or until toothpick in center comes out clean. (The original recipe says to bake 35 minutes minimum, but I did that and my edges were definitely overcooked. Next time I would start checking at 25 minutes.) Turn cake out onto a rimmed platter (or, if you are ghetto like me, a rimmed cookie sheet!) and allow to cool completely. The cake will not be as thick as a normal cake—this freaked me out at first, but once it was iced with lots of whipped cream, I decided it was actually a good cake-to-whipped-cream ratio. However, if I wanted to serve more than 12 people, I would probably do 1.5 times this recipe to make a thicker cake. When cake is cool, combine sweetened condensed milk, evaporated milk, and 1/4 cup heavy cream. Pierce surface of cake with fork several times. Slowly drizzle ALL of the liquid onto the cake—I stopped too soon last time, and the middle of my cake was too dry. This cake can hold a LOT more liquid than you think it can! Next time I will saturate the cake in installments... drizzle some liquid, wait 10 minutes, do some more, wait 10 minutes, etc. That way it can all soak in. (Note: the Pioneer Woman's recipe says to discard 1 cup of the liquid, but that offends my miserly sensibilities, so I just subtracted 1 cup of the liquid to begin with.) Cover cake with plastic wrap and chill until you are almost ready to serve it (at least 30 minutes). Don't ice it until you're ready to serve it—that way the cake won't absorb the whipped cream frosting. To ice the cake, place remaining whipping cream in mixer with 1.5 T sugar and beat on high speed until very thick and fluffy. 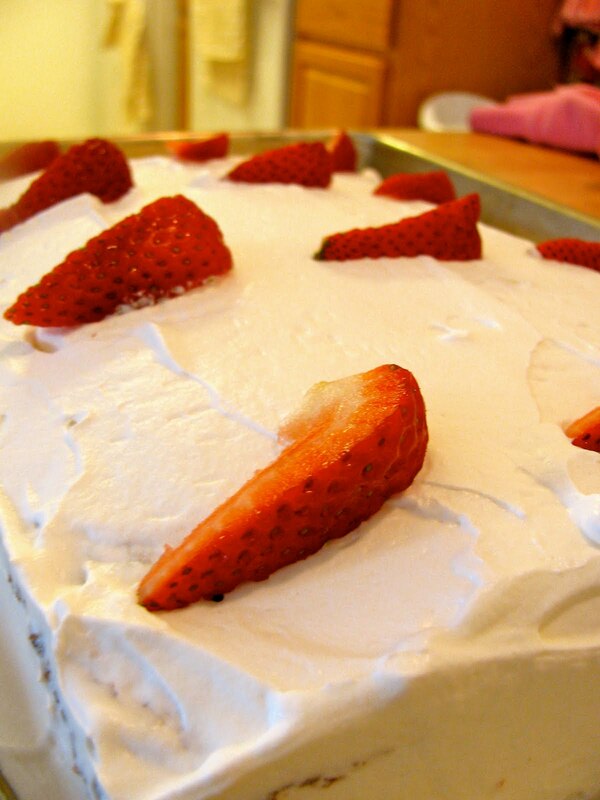 Spread generously over top and sides of cake. Top cake with maraschino cherries (a la the Pioneer Woman) or chopped strawberries (our preference!). Try not to eat the whole thing! This cake yielded 12 slices for us. The devil on my left shoulder says "MAKE THIS!" The angel on my right says "You'd better not..."
My version is at least a LITTLE healthier than the Pioneer Woman's version... a little less sweetened condensed milk and not such a sugary top frosting. But still so, so, amazing and so, so, unhealthy! That looks amazingly good. :) Just wanted to clarify: When you say the original recipe said to throw away a cup of the liquid so you just subtracted a cup of liquid to begin with- that subtraction is part of the recipe as you posted it here? I don't need to also subtract a cup worth? Oh it is amazingly good indeed!!! And yes, I already altered the recipe so that the one cup is subtracted out, so you don't have to. Your cake should take ALL of the liquid this recipe calls for.